Product prices and availability are accurate as of 2019-04-16 23:41:58 EDT and are subject to change. Any price and availability information displayed on http://www.amazon.com/ at the time of purchase will apply to the purchase of this product. 1. Multifunction: you can use it to make fruit juice, soy milk, smoothie, ice drink, grind coffee, chop meat, and more. 2. 24000 Rotation / minute, 4 stainless steel blades, powerful high quality motor, it can make fruit juice in 15 seconds while maintaining fruit nutrition. 3. 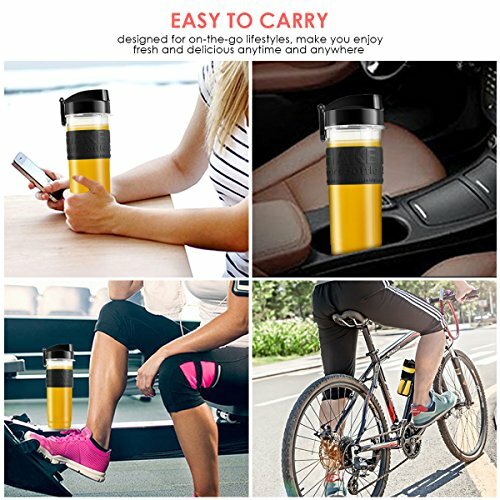 Very convenient fruit blender, changing a lid (provided), you can bring a bottle of fruit juice with you to go anywhere. 4. By purchasing a food processor you can save your time doing all these much quicker than do it with a knife. 5. Energy efficient with low power consumption, compact design easy to store. 1. The pepper grinder is not suitable for wet stuff or products with water. 2. Do not put hot water in bottle, if you want to make hot drink, the ideal temperature is 60C °. 3. Do not let the engine run for a long time, or the temperature will go too high, overheat protection starts. In this case, it is necessary to disconnect the blender, wait machine temperature lower for next use. 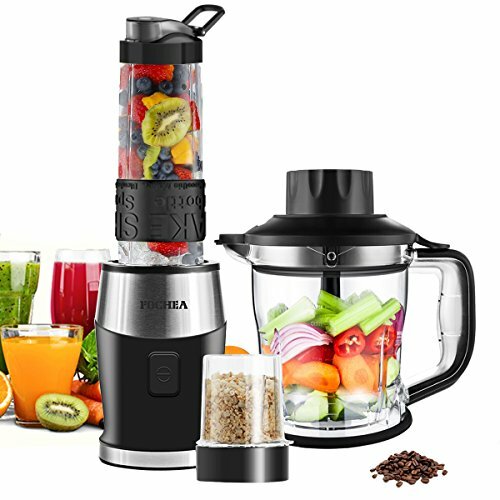 Make smoothie, juice, ice drinks in seconds, sleek design. With portable 570ml BPA-Free bottle, you can enjoy fresh drink anytime, anywhere. Great 1.5L meat grinder: 700 Watt 24,000 RPM motor and 4 stainless steel blades, simply put meat into grinder, connect power, it will turn into a fine grinded paste ready to be cooked. Create your own fresh gourmet burgers, meatballs, sausages, etc. Can also be used to grind vegetables, garlic, fruits, and more. 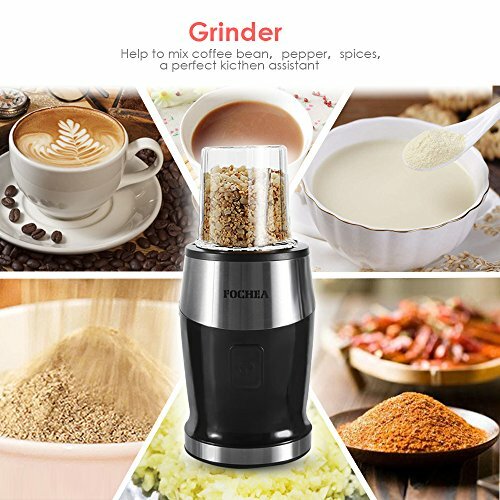 Convenient 300ml small grinder, make pepper garlic cereal coffee been powder quickly and easily, great kitchen helper. High Quality & Top Performance: produced with heavy-duty plastic and stainless steel, durable. Every part (except the base with the motor) is dishwasher safe and all parts are BPA free. 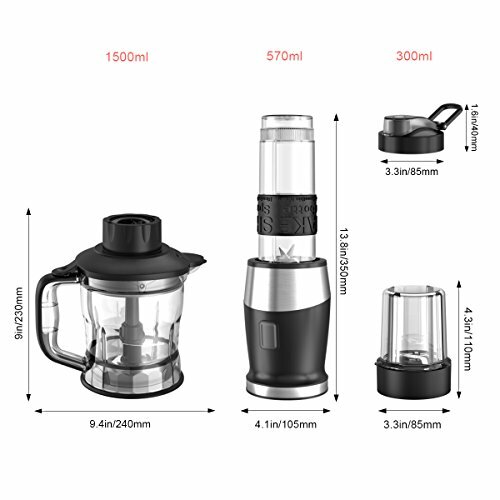 What you receive: 1x blender, 1x 570mL Bottle, 1x 300ml Chopper Bottle with 2 blades, 1x 1500ml Meat Grinder bottle with 2x2 blades and Fochea 1-Year Worry free Warranty.